Last 2nd February in France was Chandeleur, a holiday once religious, known now days as the Crêpes Day! It’s basically a day dedicated to crêpes, during which all French eat crêpes. As it was in the middle of the week, and despite the fact that making a single crêpe is fairly quick, but making them for 3 people is a job, we decided to post pone the celebrations to this Saturday, uniting them with the celebrations for World Nutella Day hosted by Sara and Michelle! And, apart the usual savoury crêpes, with ham, mushrooms and Ementhal, we decided to end our crêpes meal with simple Nutella crêpes! The night before: in a large bowl mix flour, eggs, salt and oil. Slowly add milk and beer, stirring constantly, even with a whisk. You have to obtain a smooth, airy and velvety mix. Cover it with a tea towel and let it rest for the night. The day of the crêpes, whisk the mix vigorously. Heat a large heavy non stick pan (24 centimetres). Add a little knob of butter (or a few drops of oil) and let it melt. Wipe it away with a piece of kitchen paper. Add a ladle of crêpes mix and spread it all around your pan, moving it all around with the handle of the pan. If the first crêpe don’t come out nicely, do not worry: it always happen! Eat it right away and adjust the amount of mix you put in the pan. Continue to make crêpes until you finish you mix. Classic triangle (as in the picture above): spread your nutella all around a crêpe, fold it in half, and then in half again to form a triangle. Eat it. Classic roll: spread your nutella all around a crêpe, roll it. Eat it. Stack: spread your nutella all around each crêpes and stack them one over the other, to form a round cake. Sprinkle with nuts brittle and serve. 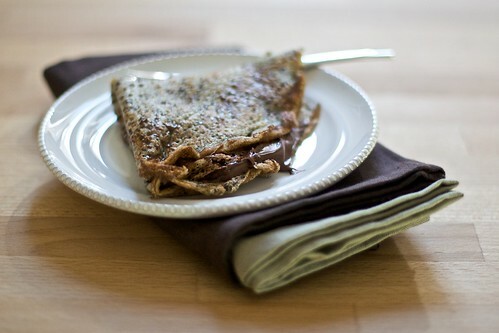 If you dare, mix nutella with mascarpone (the quantity you like) and use the cream for the filling of the crêpes. Then, after eating them, slowly sink in you sofa and sleep, heavenly in peace with the world!